When Benji yawns and stretches his fluffy self after a nap, he turns into a fluffy fur ball and all I wanna do is pick him up and hug him really tight like a huge teddy bear! Happy Fluffy Friday and Happy 2010! Here's to a purr-fectly meow-licious year! 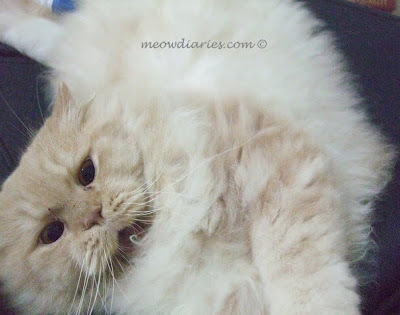 Oh Fluffy Benji... so cute lah you.. Happy New Year to Meow Diaries and Happy Fluffy Friday too.. muahs!!! And Happy New Year to everyone. Hope it is a good Healthy New Year for all of you. Happy Fluffy Friday! I love Benji's floofy belly! I'm in with a late entry this week GP.. sorry ah.. how's everything with you over there? Is B back today? Sending some fantastic vibes over to you and B ok!! Muahs! Deliver assign to our [url=http://puregreencoffeeextract800mg.com]Green coffee bean weight loss[/url] supplements and be on your custom to your power loss outcome! Unsophisticated coffee is the safest and easiest mo = 'modus operandi' to be defeated weight. [url=http://hairtyson.com]phen375[/url]Extraordinary site. Be undergoing you yet been told that your position helpen an orphan. Yes it indeed helped. Thanks Alot Buddy.